The new game from RunMan: Race Around the Worldco-creator Tom Sennett is an arcade-style platformer called Deepak Fights Robots. You need to give it a look, simple as that. Assuming you have access to a PC (Windows or Linux) or a Mac. In addition to being a talented game designer, he knows a thing or two about making awesome, eye-melting websites and is more skilled with MS Paint than I’ll ever dream to be. Deepak Fights Robots is his first venture into paid-indie-game territory; I hope it’s a success. I’ve played through the game already, so let me give you the highlights. Deepak Fights Robots is, in my opinion, best described as Bollywood’s psychedelics-induced take on Bubble Bobble. What it lacks in pure dancing delight is made up many times over by the inclusion of tigers, groovin’ sitar jams, and one seriously manly Indian mustache. The game is broken up into quite a few short levels, with the common goal always revolving around you grabbing shiny collectibles. (I’m not entirely sure what they’re supposed to be.) Something about a robot pimp locking you in the Cave of Robots, so sure, why not? Who cares what they are. Get ‘em all without bumping into any enemies, and you’ll go into invincible-superhero mode. You then complete the stage by blasting all of the enemy robots in the most heroic of fashions. Quick, fair, and fun — like I said, this is an arcade-y game. Dying merely restarts the level, instantly; I’ll add that I never once felt frustrated upon totally blowing it. There are also items to collect for points — there’s a big ol’ leaderboard at the end of the game — and you can also pick up animal pals like the aforementioned tiger to give you an extra hit’s worth of life. The music is amazing. It’s by Family Funktion and the Sitar Jams. The soundtrack meshes perfectly with the equally bizarre and charming visuals — it pushes you to keep playing just one more level. As per usual, Sennett’s art doesn’t play particularly well in screenshots, but it’s always a treat to see in motion. Think Yoshi’s Island as recreated in MS Paint on a tight budget. Deepak Fights Robots isn’t terribly long, and $9.95 (even with free lifetime updates) can be a lot to ask of some of the more frugal readers in attendance, but it is fun throughout. That’s more than I can say for most games lately, independent or otherwise. I’ll take quality over quantity any day. Also, there are cows that inexplicably wear glasses. Love it. 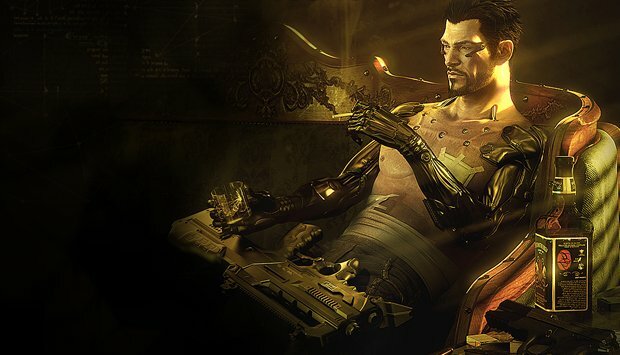 How does some downloadable content for Deus Ex: Human Revolution sound? On the game’s official site, a post describing the first add-on has gone up. Dubbed “The Missing Link,” it will fill in three days of the main storyline in which Adam is trapped on a freighter with his augmentations left disabled. New environments and characters are promised, and it sounds like you’ll have the opportunity to (at least temporarily) rebuild Adam’s augments. I think most of us could use an excuse to try a different loadout without starting a brand new save file from the beginning. Platforms and price points haven’t been divulged, but the post says this content will drop in October. Last week, we turned your attention to a countdown clock ticking away at the Carmageddon official website. It’s number is now up and, as you might have suspected, it’s the announcement of a brand new installment in the violent driving series. Stainless Games has reacquired the IP and is currently looking for a publishing partner for Carmageddon: Reincarnation, a download-only title. After more than a decade, Carmageddon is seemingly back. That ought to tickle a fancy or two. I don’t recall playing more than twenty minutes of any game in the series and it’s been so long that I doubt I would remember even if I had. But I know that fans do exist and they’re no doubt bouncing with glee right about now. ZodTTD, the developer behind a PlayStation emulator for the Android OS, was shut down recently. The software was pulled down off the Android Market. Now another developer follows, possibly pointing to Google’s desire to keep things clean and legal on their Market. Yong Zhang, an Android dev that had several emulators lined up for the OS, has been locked out of the Android Market. Ars says that his applications were removed from the store and his account was terminated by Google without warning. Zhang had a SNES emulator in the works called SNESoid. Some allege that code may have been taken from another popular SNES emulator, snes9x. I’m sure Android users aren’t in a panic yet. There’s plenty of emulators to go around for now. I don’t know how long that will last, though. With devices like the Xperia Play coming out, it won’t make sense for software that permits the use of illegal ROM copies to be available alongside more official offerings.